We treasured that tiny container – this was a treat from all the way from across the pond with little likelihood of being replaced – and eked it out in little portions. My favourite way to eat this syrup, bizarrely, was straight up, poured over raw porridge oats and left to macerate for a few minutes until the mixture became beautifully soft and sweet. I’m sure my dentist – and my Mum – would have any number of objections but in my defence, this odd concoction probably wasn’t so very much worse than any of the sugar filled breakfast cereal options out there nowadays (it’s a tenuous excuse, but I’m sticking to it). Nowadays I like my maple syrup in slightly more acceptable forms: drizzled over bananas and yoghurt for a simple, speedy dessert, made into ice cream laced with sticky wet walnuts or incorporated into baking as an alternative to sugar or honey. Maple syrup has an extremely distinctive flavour so isn’t always a suitable sweetener, but every so often a recipe comes along that allows it to shine right through. While I very much subscribe to the eggs, butter, flour and sugar school of baking, I’m aware that not everyone can enjoy these delicious ingredients. I read a number of blogs where the authors are gluten free or baking for those with allergiees, a close friend of mine is a coeliac and another has recently been diagnosed as allergic to both flour and eggs. Like buses, these things seem to come at once and this week I have not one but two gluten free, egg free meals to make. Undecided as to what to bake for both desserts, I spent some time experimenting this weekend, looking at everything from naturally gluten free ice creams to things like cakes and pastry which requite a little substitution to make them entirely allergy friendly. I’ve had my eye on these tartlet cases over on Erin’s Yummy Supper blog for a while and now seemed like the perfect time to try them. Having some dark maple syrup to hand I substituted it for the honey, and seeing that the butter used in this recipe was melted, I couldn’t resist browning it for that beautiful, nutty beurre noisette flavour. 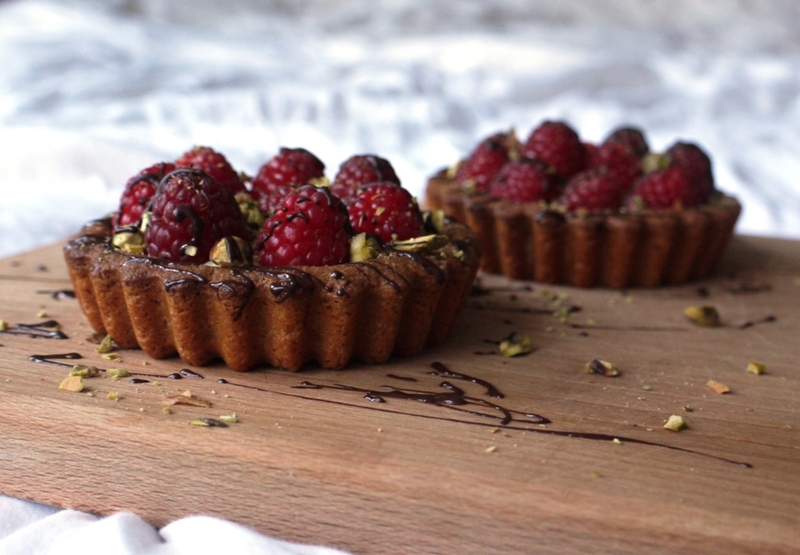 Again incorporating ingredients I had in my kitchen I then made up a simple vanilla pastry cream, topping it off with fresh raspberries, toasted pistachios and a drizzle of dark chocolate. These tartlets are entirely gluten free but I’d recommend you try them even if you’re a regular fan of flour. The maple syrup shines through the nutty tones from the brown butter and ground almonds and the pastry has a lovely crisp, unusual texture. There’s egg in the pastry cream so if I make this for my egg free friend I’ll be substituting in whipped cream or mascarpone. If you or your loved ones are on a restricted diet, you could easily do the same. So there you have it, simple, gluten free ‘pastry’ without any of the effort of rolling and trimming and the perfect showcase for the joy that is maple syrup. Possibly a slight step up from the sickly-sweet breakfasts I was sneaking in as a little girl . . . If your tartlet tins aren’t non-stick, grease with a little butter. Preheat the oven to 175 degrees C.
Melt the butter in a saucepan over a medium heat. Continue cooking, swirling the pan constantly, until the butter starts to foam and crackle and the milk solids separate out begin to brown. Once the butter is golden with a nutty aroma, remove the pan from the heat and set aside to cool completely. Add the maple syrup, ground almonds, cooled melted butter and salt to a bowl and mix until well combined. Divide the mixture between your six tartlet tins and press into the bottom and sides. Prick all over with a fork then bake for 10 minutes. After 10 minutes, remove the tarts from the oven. The ‘pastry’ will have risen up so prick again with a fork and use the back of a teaspoon to push back into place. Return to the oven and bake for a further 6 – 8 minutes until golden and firm. In a small bowl, whisk together the egg yolks, sugar and corn flour. Bring the milk and cream to a simmer. Stir the hot cream into the egg mix then return to the saucepan and gently heat, whisking constantly, until thickened. Strain into a bowl and pop in the fridge to firm up (minimum 30 minutes), covered with a disc of greaseproof paper to stop a skin forming. Put the pastry cream in a piping bag and pipe a swirl into each tartlet case. 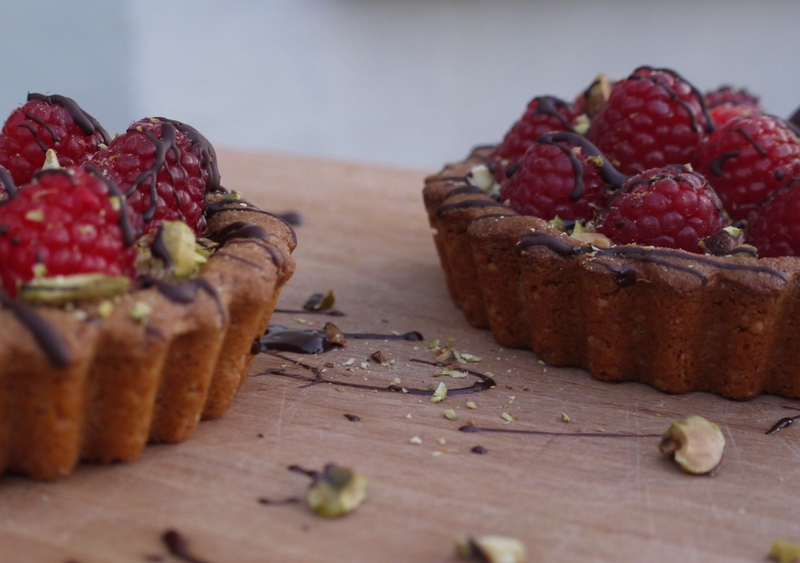 Top with raspberries and sprinkle with the chopped pistachios. Finally finish with a drizzle of melted dark chocolate. Store in the fridge until ready to serve. We ate these on the day of baking and one day later. The final two tartlet shells were a little soggy by the time I tested them on the second day so I’d advise eating these within a day of making. These look lovely! And I am totally on the brown butter bandwagon as well … Amazing addition to banana bread and now writing up a post on brown butter chocolate chip cookies. Life will never be the same again, lol. And I love that you used pistachios and raspberries, beautiful colours and great flavour pairing! These are BEAUTIFUL! Great photos and so appetising to look at. 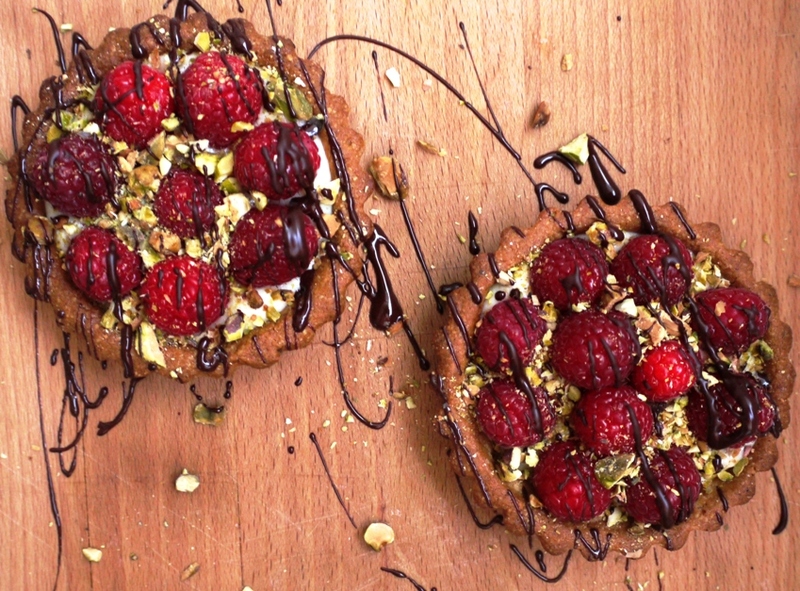 Raspberries and pistachios are such a great combination, especially in the contrasting colours. What a work of art! Love the idea of this tart crust; I never like the gluten free pastry that I make so this looks like such a great alternative. And such a lovely combination of flavours and textures. So pretty! I have been looking for a gluten free pastry and this is just perfect. Thanks for sharing. You are a genius! Not only have I just been given a litre of maple syrup by a friend from Maine, but I promised to help a friend gather up some gluten free recipes for her mum who is coeliac. Sophia – ahh, brown butter chocolate chip cookies are sooo good! Kathryn – I’ve never tried gluten free pastry with a special flour so would definitely like to compare the two. This is a lovely thing in its own right though, and not completely comparable to pastry. Emily – thank you, do let me know how you get on. Stephanie – so pleased to be of use! North South Food – hooray! The dough does bubble up after the first bake but you just push it back down then it stays perfectly put. So pretty tartlets! I have never tasted maple syrup but I believe when you say it is similar to honey, so I reckon the combination of these tastes is a little bit of heaven. Thanks for sharing!! Need to give them a a go… interesting recipe, thanks! Oh yum, these sound just divine! 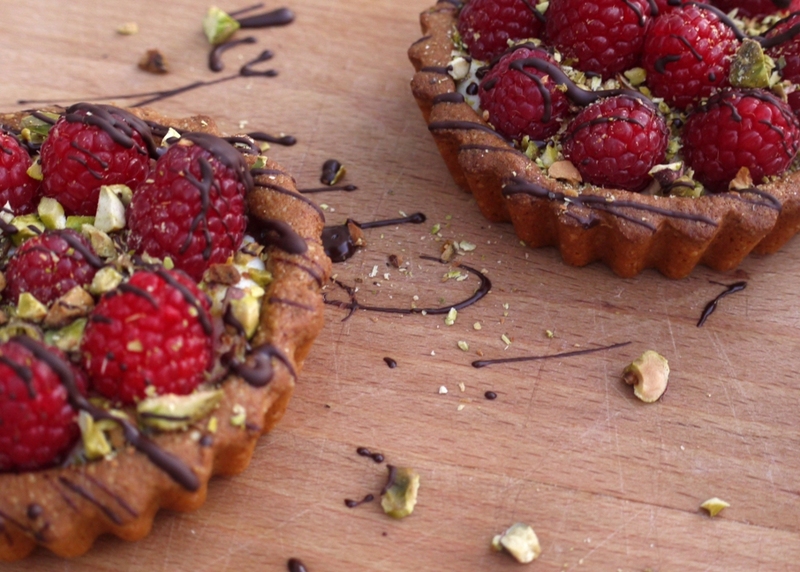 I love the combination of raspberry + pistachio, so I know I’d love there! These little tartlets are adorable! I love really good maple syrup, and now I am craving for pancakes with a generous drizzle of maple syrup! My Little Italian Kitchen – thank you. Amy – it’s a lovely combination. Raspberry and hazelnut is delicious too. Bianca – thank you. And yes, maple syrup on pancakes is hard to beat. I’m so honored to see your beautiful tartlets! I love the brown butter and maple sugar additions. And of course your baking creations are gorgeous as always. Mmmm! Those tartlets look so pretty and delicious. What a great idea for a flavor combination! I have always been wary of gluten free pastry but this has got to be the recipe to change my mind. You have definitely made something that any gluten intolerant person would choose and thank you for. Great discovery! What a beautiful interpretation of Erin’s tartlets. They look stunning. I love your addition of maple syrup. It’s an ingredient I don’t use that often, it’s not typical in Greek cuisine but it’s amazing. I never would have put raspberry and pistachio together, but as soon as I read it I knew it was going to be amazing. They look fantastic. The combination of raspberries and pistachios is so unique. The chocolate would add complexity, too. What beautiful photos…thanks so much! 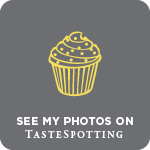 What pretty little tarts – and GREAT flavors! Those are beautiful! Wonderful idea to brown the butter, that always adds such nice flavor. Connie – I’d never made it before either but they were delicious! Frugal Feeding – thank you and haha, very funny. 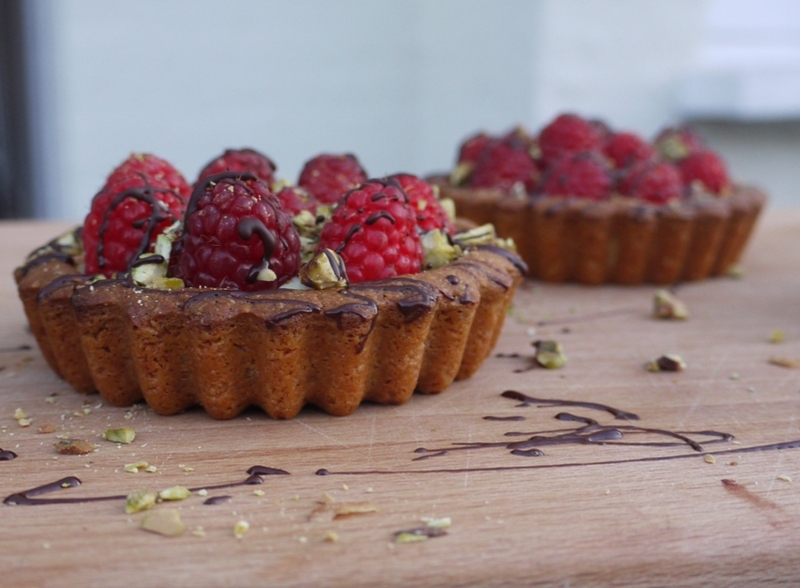 Laura – I think the fact that it doesn’t try to mimic ‘real’ pastry is why it really works. Magda – thank you. I need to try her honey version soon as can imagine it’s utterly delicious. Laura – raspberry with most nuts is delicious! Three of my favorite things: browned butter, nuts, maple syrup. I love the shot that captures that shiny drizzling of dark chocolate. Beautiful! Great flavour combo. Love the sound of the almond base – is it more like cake or cookie than pastry? Hope your special diet friends appreciated your effort and enjoyed their specially tailored desserts. Lucy – no, definitely not cake-like. It’s lovely and crisp like pastry on the day of making although I did find it softened and went slightly soggier after about 48 hours. Beautiful!!! I love this recipe and the tartlets are stunning! Just change the berries for another fruit and we can make these year round! Could you make the tartlets and the cream the night before? and then just put it all together on the day? That should be absolutely fine. Just don’t leave them that much longer than that as they have a tendency to go slightly soggy!